Snacks are packed and sunscreen is applied. Kids are strapped into car seats and seat belts. You’re ready to head out on a hike with your family. But, as is so often the case, your kids have another agenda in mind. Instead of completing that two-mile loop, you barely make it two hundred yards before things go off the rails on the trails. For most adults, fresh air and beautiful scenery are reason enough to head out for a hike. But even in a region with incredible outdoor recreational opportunities like Traverse City, kids often need something more to nudge them out the door and keep them headed in the right direction on the trail. As parents to three young girls, it’s been our experience that finding or creating adventures that keep our kids excited while out on the trails is the best motivation. Here are a few family-friendly ideas for adventurous outdoor activity in the Traverse City region. We are passionate about engaging the imaginations and inspiring the curiosity of children, and so we set out to build a special spot for kids in a place we love. That’s what inspired us to build the Fairy Trails along the Cedar Cathedral Trail at The Village At Grand Traverse Commons. The Fairy Trails are full of tiny fairy houses built out of all natural materials such as sticks, stones, shells and pinecones. Some fairy houses are very elaborate and detailed. A few weeks back we held an event at the Fairy Trails at which local artists built and placed almost 20 new houses on the trails (you can see many of the new houses and moments from the event in the accompanying video). But what’s most fun about the Fairy Trails is watching kids explore and discover the existing fairy houses, and then be inspired to build one of their own. Kids of all ages are invited and encouraged to leave their own creative and all natural mark on this magical place. Pyramid Point is one of our family’s favorite hiking spots in the Sleeping Bear Dunes National Lakeshore. 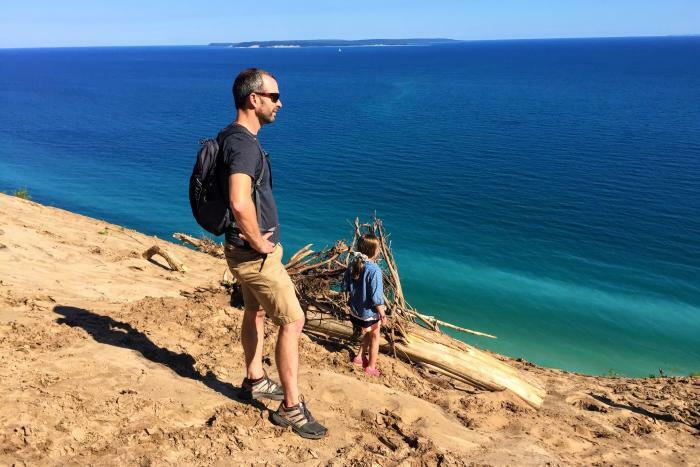 It’s a family-friendly trail which cuts through meadows and maple-beech forests before reaching the high bluffs that feature incredible views of Lake Michigan and the Manitou Islands. It’s not a difficult hike for most adults, but presents a bit of a challenge for little ones who have fun scampering up the ascending trail. The payoff at the top is worth the effort for everyone! After descending the Pyramid Point trail, head over to Port Oneida Beach to cool off. It’s a short distance (less than a mile) from the trail head, and is one of the best secluded beaches in the National Lakeshore. 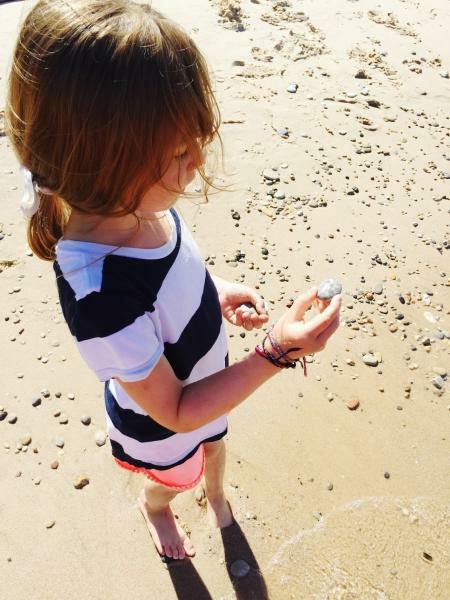 It’s also one of the spots where we’ve had the most luck hunting for Petoskey stones, which is always a fun diversion for kids. Combining hiking and beach time -- it’s one of the best ways to keep kids motivated while spending time outdoors. The DeYoung Natural Area is one of the natural areas preserved and maintained by the Leelanau Conservancy. DeYoung is set on an historic farmstead on Cedar Lake that dates back to 1870. It’s a short 10-minute drive, or 20-minute bike ride (you can access it from the TART Trail), from downtown Traverse City. There are hiking trails through forests and scenic meadows, and there is a great fishing platform stretching over a mile of preserved shoreline on Cedar Lake. On a recent drizzly Sunday morning, we spent nearly two hours catching fish after fish (including some good-sized Rock Bass using Barbie poles!). There is also an edible garden called the Cedar Creek Food Forest full of different varieties of fruits and vegetables. One of our favorite activities to engage in while hiking at DeYoung is to create “adventure maps” that our girls use to navigate the trails. The maps make hiking a game because they’re full of imaginary, “dangerous” obstacles such as jumping frogs, angry pirates, bears, and even quicksand! Whether we’re building fairy houses at the Fairy Trails, hunting Petoskey stones on the beach, or creating adventure maps for a hike, all of these activities help to engage kids in active and creative fun that keeps them motivated to spend more time in nature. If you can turn the outdoors into a playground where your kids’ imaginations run wild, their bodies will follow, especially in Traverse City. Jay and Heather Harrington are thrilled to be raising their family and pursuing entrepreneurial ventures in Traverse City. They moved to town almost two years ago with their three young girls. A little over a year ago, they launched a new Traverse City-oriented blog, Life and Whim, through which they share a unique perspective on the entrepreneurial and cultural scene in Traverse City, as well as their love of the outdoors in Northern Michigan. They recently launched a new northern Michigan inspired lifestyle brand and e-commerce shop featuring apparel, enamel pins and books for active families that love the great outdoors. They are living out big dreams in their favorite small town.